Archives for November 3rd, 2017 | Welcome To Your Pet Space! For thousands of years, the horse has assisted the human in numerous ways including during battle, in industry, as transportation, and for pleasure. Using horses as therapy is often considered a modern form of treatment. However, historical records show that the ancient Greeks already recognized the many health benefits of therapeutic riding. 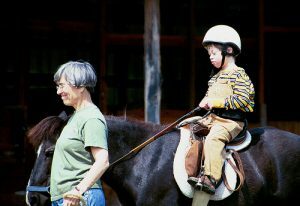 This young boy is going to benefit greatly from therapeutic riding! Since October was National Disabilities Awareness Month, we look at therapeutic riding for the disabled and how it improves the quality of their lives. Therapeutic riding is a unique form of therapy using horses. It provides many different benefits to people with special needs and conditions such as cerebral palsy, autism, mentally challenged, amputees, paralysis, ADD, and down syndrome. It assists individuals with different challenges in a positive way, improving their physical and mental well-being. As far back as 600 B.C., Orbasis of ancient Lydia documented that riding horses was more than just a form of transportation and noted the value that it had on those with handicaps. In 1875, the French physician, Cassaign, documented his study of riding horses as a form of treatment for different conditions. He concluded the improvement in posture, balance, and joint movements as well as significant psychological improvements. In England during 1918, a physiotherapist known as Miss Olive Sands took her horses to a hospital outside of Oxford to test riding as therapy for soldiers wounded in the trenches in World War One. Many patients were amputees, and they discovered that they felt less pain when riding. Lis Hartel deserves a special mention, as she was the chief motivation behind the start of riding centers for the disabled across the world. 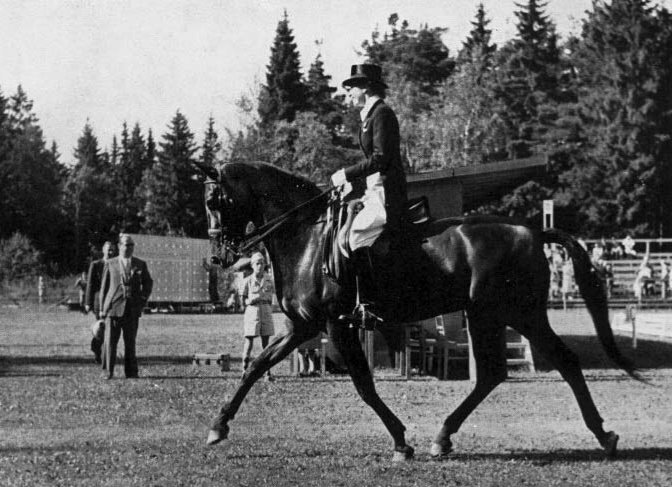 Lis Hartel, a Danish dressage rider, won individual silver for her country during the Helsinki Olympic Games in 1952 and again in 1956. 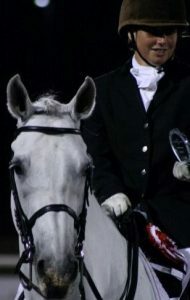 She was the first woman to represent her country on an equestrian Olympic team and was also the first female medalist. What makes Lis Hartel even more remarkable was that she competed at the highest level with a significant physical disability. In 1944, aged only 23 and pregnant with her second child, Lis was struck with polio, leaving her paralyzed below the knees and affecting her arms and hands. Lis gave birth to a healthy daughter and was determined to continue her dressage career. After three years of rehabilitation with the help of her mother and her husband (and against medical advice), she eventually rode again. The magnificent Lis Hartel and Jubilee. Lis was unable to mount and dismount the horse on her own, so her husband would lift her on and off of her horse. When she won the silver medal in 1952, the gold medallist, Henri Saint Cyr of Sweden, carried her from her horse, Jubilee, onto the podium, which is considered one of the most emotional moments in Olympic history. Shortly after the Helsinki Olympic Games, Lis, along with her physical therapist, founded the first Therapeutic Riding Center in Europe, which she always considered her greatest achievement. The medical community took notice, and, eventually, other Therapy Riding Centers opened in Europe, North America, and across the world. After her retirement from competitive dressage, Lis travelled globally giving demonstrations and raising money for polio sufferers, as well as supporting riding for those with disabilities. She died February 12th, 2009 aged 87, but her legacy lives on. Therapeutic riding for the disabled has numerous benefits and is considered one of the most effective forms of rehabilitation. It also allows the rider to experience a unique connection to the horse that other activities are unable to provide. For those who see the world from a wheelchair, riding a horse allows them to be above everyone else for a while as well as experience the feeling of walking. The therapeutic riding lesson is carried out in an enclosed area under the guidance of a qualified therapeutic riding instructor. For lessons to go ahead, centers rely heavily on their volunteers. So many people are involved to help one child work on his balance. For each rider, one person is required to lead their horse along with one or two side walkers. 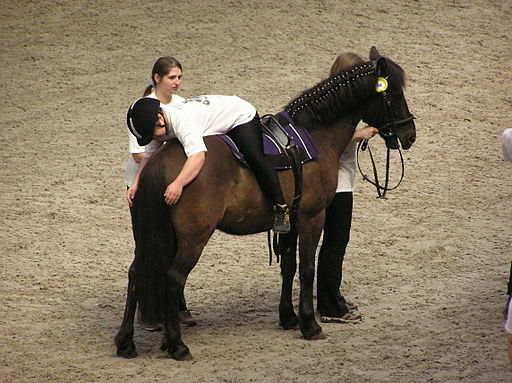 It is very much a team effort, and volunteers are given training before taking part in the riding sessions. Leaders are responsible for controlling the horse before, during, and after the lesson, helping him follow the directions given by the rider and ensuring both of their safety. Side walkers walk beside the horse and provide physical and emotional support to the rider, helping and encouraging them to reach lesson goals. Volunteers must understand how to interact with the students as their attitude has an enormous impact. Lessons begin with a warm-up session using various exercises to help the rider stretch their muscles, find their balance, and build up their confidence. The rider learns how to control their horse. They are required to say their horse’s name before giving the command to “walk on” or “stop” to help create a bond. Those unable to communicate verbally give a gentle tap on the horse’s neck with their fingers. The lesson consists of steering and controlling exercises, for example, maneuvering in and out of cones, going over ground poles, and stopping at a particular place. 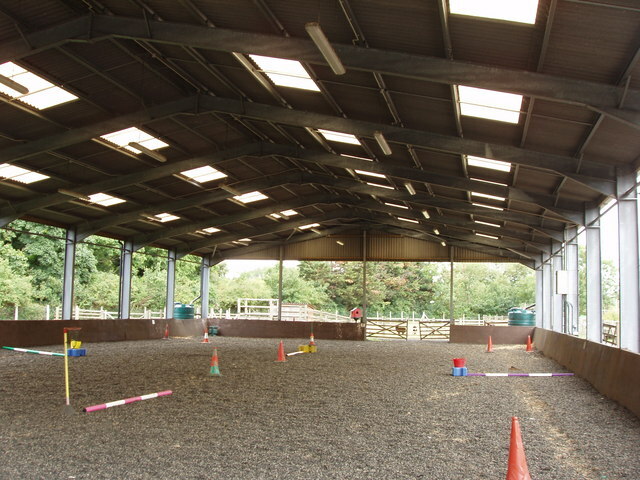 An example of an arena used for therapeutic riding. Different types of games are built into the lesson to encourage problem-solving and decision making by matching shapes, colors, letters, numbers, and pictures. They are also often required to carry items when riding or throw a ball or hoop, using each of their hands to improve their coordination skills and strengthen both sides of their bodies. Many owners kindly donate their horses to be used in therapeutic riding programs. There is no particular “type” or breed of horse that is selected, and they all vary in age, size, confirmation, and temperament. Qualities are based very much on the individual horse. 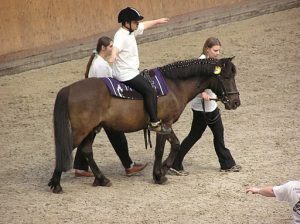 During the training and trial period, the horse is exposed to all aspects of a riding lesson without a disabled rider on its back. Going through her paces to see if she’ll make a good therapeutic riding horse. This training includes exposure to loud noises and music, learning to be lead next to a handler, responding to their body language and rhythm, tolerating items such as batons and flags handed back and forth and carried by the rider, and the ability to stand still when mounted from a ramp. They must also learn to accept items such as wheelchairs and not spook at them. Once a horse is accepted into the program, as well as taking part in lessons, his work will consist of long lining, longeing, hacking out, and schooling in all three paces by an able-bodied rider. Studies have proven that therapeutic riding has a positive impact on those with disabilities, improving their quality of life. 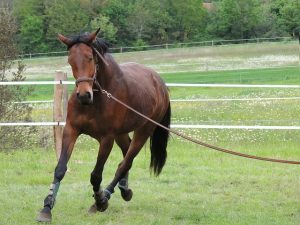 Many make rapid progress in comparison to other treatments and can often carry out tasks on a horse that they are unable to do in a clinical environment. Therapeutic riding also brings people together from all walks of life, from the riders themselves to professionals from the equine and medical professions to the many volunteers who give up their free time. And of course, let’s not forget that noble creature the horse who makes therapeutic riding possible! A unique friendship is made during lessons. If you wish to volunteer for therapeutic riding lessons or if you know someone who would benefit form therapeutic riding, contact your country’s organization for centers in your area.